With kitchens scissors, cut and remove membrane on under side of lobster tails. Remove meat. Cut meat into 1-inch pieces; place in medium bowl. Set aside. Bend shells backwards slightly to flatten; place in 8-inch square pan. Melt butter in medium nonstick saucepan over medium-low heat. Stir in flour with wire whisk; cook and stir 1 to 2 minutes or until smooth and bubbly. Gradually add warm half-and-half, cooking and stirring 2 to 3 minutes or until mixture boils and thickens. Remove from heat. Stir in lemon juice, sherry, mustard, 1/4 teaspoon salt and hot pepper sauce. Reserve 2 tablespoons cheese for topping. Add remaining cheese and egg yolk to hot mixture; mix well. Stir half of sauce into lobster meat in bowl. Spoon mixture into lobster shells. Top each with remaining sauce. Sprinkle each with reserved cheese. Bake at 375°F. for 15 minutes or until edges are bubbly. Broil 2 to 3 minutes or until cheese is golden brown. 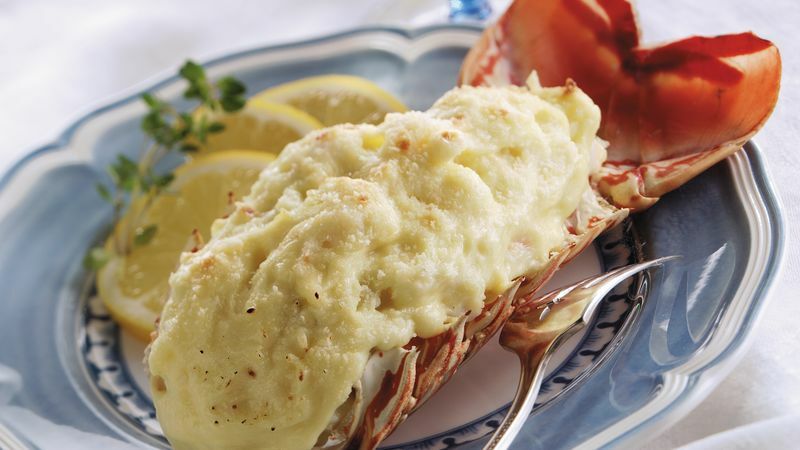 Classic lobster Thermidor calls for whole cooked lobster. Our simplified version uses meaty lobster tails only. Napoleon named this dish after the eleventh month of the French Revolutionary calendar. He tasted the recipe in Thermidor, which spans July 19 to August 17. The most common type of lobster in the United States is called the Maine or American lobster. This variety is found off the Atlantic coast of the northern U.S. and Canada. Spiny lobsters are less common and are often called rock lobsters. They are found in the Mediterranean and off the coast of South Africa. If you purchase frozen "rock lobster tails," they are from the spiny lobster.